How to Use Missinglettr - How to set up the schedule for my campaigns? All Categories ​>​ Getting started ​>​ How to set up the schedule for my campaigns? You’ll find all you need in the “Dates & times” option on your “Settings” tab. 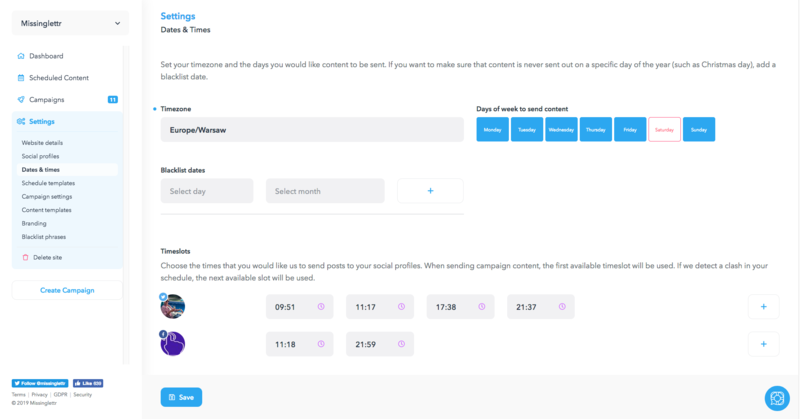 Here, you’ll be able to specify a timezone for your campaigns as well as days of the week when Missinglettr is allowed to post to your social media. When a day is marked in blue it means Missinglettr can schedule posts on that day of the week. If the day is white/red Missinglettr won't be able to schedule posts on that day of the week. If you wish to prohibit Missinglettr from posting on specific days, you can do that with the blacklist option. You can also pick the time slots when you want your content to go out to specific social accounts. Each time slot can be claimed by a single campaign post. If you define 4 open time slots, that means that Missinglettr will only be allowed to schedule up to 4 posts on any given posting day. A single social profile can have up to 33 time slots open, tho we don't recommend having more than 24 open slots for a single social profile..